Well, just a bit of excitement before bed last night and a subject of conversation all day today. The raccoon’s fate was discussed and rediscussed and as darkness fell Mom was on guard in the nest to prevent a reoccurrence. We will have to wait and see if he returns or if he took last nights lesson to heart. The day started warm and clear with a beautiful sunrise and a tasty fishy for breakfish. As the morning progressed it clouded up again and a short rain shower hit the nest. Mom flew in for moral support and the kids endured the short shower. Dad and Mom both brought in some new furnishings for the nest after the rain. Dad did a neat thing about mid-afternoon. He brought a pigeon to the nest and just set it down and waited to see what would happen. After a few minutes Peace came over and started trying to de-feather the bird. What a neat sight. After a couple of minutes of Peace struggling Dad pitched in and helped make the nest look like a pillow fight gone bad. Crops were filled and the kids rested up. 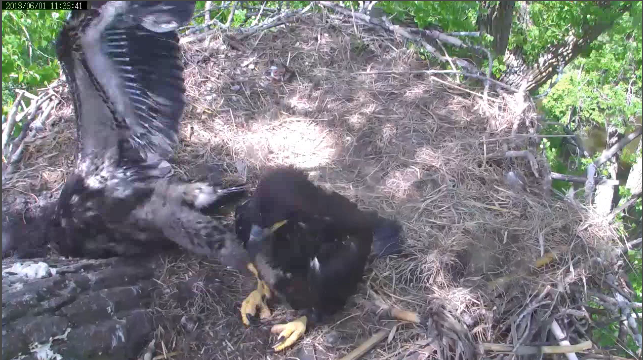 Peace has also taken to nibbling on Harmony’s wing when she pauses during wingersizing. It’s cute to watch but I’m not sure H appreciates it. Mom came back to the nest at one point and got some mud on her beak and Harmony decided it was her job to improve Mom’s look by removing the mud. Dinner on the nest was something furry and dark red but didn’t look like used raccoon. After dinner Mom dug in the nest and dirtied her head feathers to make her more stealthy in case the intruder comes again. As darkness fell all was quiet on the nest. Some selected scenes of the day put together by the wonderful Razzle! Harmony squees for lunch during the rain. 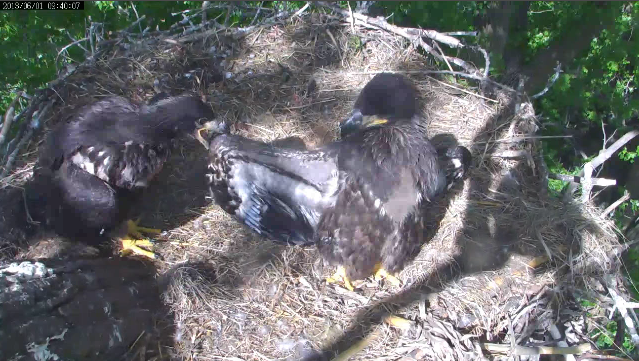 MNBound Eaglets Why Does It Have to Rain Mom? Peace on her first de-feather mission. And select pics from the day. Pssst! Peace! Do you really think that was the Boogeyman last night?? See you can do this wing thing lying down! Mom's right! This is cooler! Nibble Nibble, you're a Tribble! Stop That! We gotta get Dad to fix this rail! Now just hold still for a minute! A preen of the feather to Razzle and BBC for the great vids and pics of the day! Thanks! It was a fun and lively Saturday here at the MN Bound nest. Hope you had a good day! We’ll see you here tomorrow!